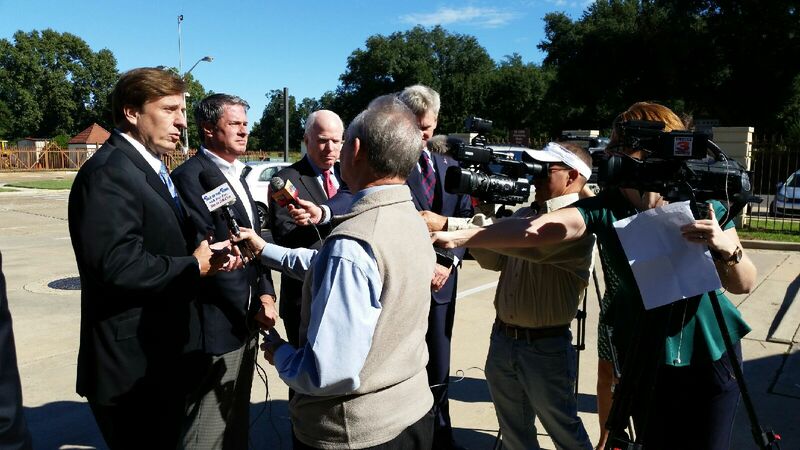 Tom Pace, executive editor and radio host of “Talk of the Town” The Promise 90.7 FM, interviews Congressman John Fleming, Senator David Vitter, Senator John McCain, and Congressman Bill Cassidy outside Barksdale Air Force Base Tuesday. Senator and former presidential nominee John McCain, R-Az., joined Senator David Vitter, R-La., Congressman John Fleming, R-La., and Congressman and republican Senate nominee Bill Cassidy to tour Barksdale Air Force Based Tuesday. “The professionalism and dedication of these people is incredibly impressive. Whenever we get jaded in Washington, we come out here and see the men and women who are serving and they made it clear to us the relation between air force and the people here is remarkable,” said McCain. McCain, Vitter, and Fleming all touted Cassidy to replace incumbent Senator Mary Landrieu, D-La., in the Nov. 4 election. “Obama said this election is a referendum on his policies. America is failing throughout the world because of his lack of leadership and his abandonment of leadership in the world. When we have Bill Cassidy in the majority we will turn that around and we will act together,” said McCain. Vitter explained that the visit to Barksdale was also a great opportunity to showcase its value in the event Cassidy swings the Senate majority in the GOP.